Overnight Oats are so versatile, and like a classic warm bowl of oatmeal, they are easy to make. 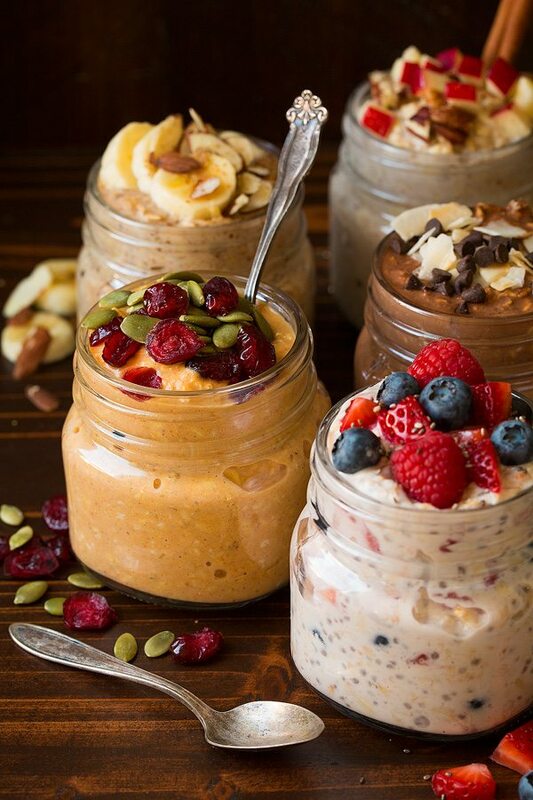 Learn how to make this basic overnight oats recipe, plus five delicious mix-in flavor recipes! 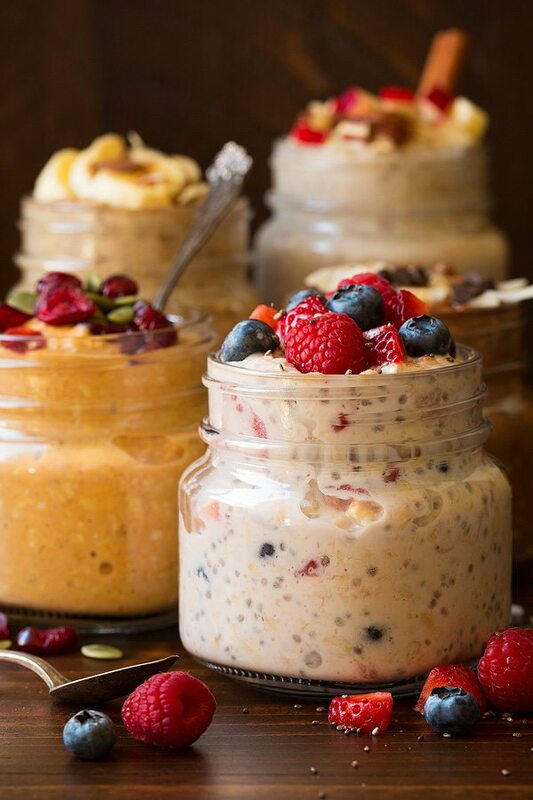 Overnight oats are simply a blend of raw rolled oats, liquid, salt and a sweetener of your choice (which is optional, yogurt is also optional). You mix everything together in a jar and let it rest in your fridge until you’re ready to enjoy! For the best texture, I do like to allow full 8+ hours of rest time, but in a rush 4 hours should do. Really though, where have overnight oats been all my life? I know I’m late to this party because I just recently tried overnight oats for the first time, but I have to say they are totally genius! 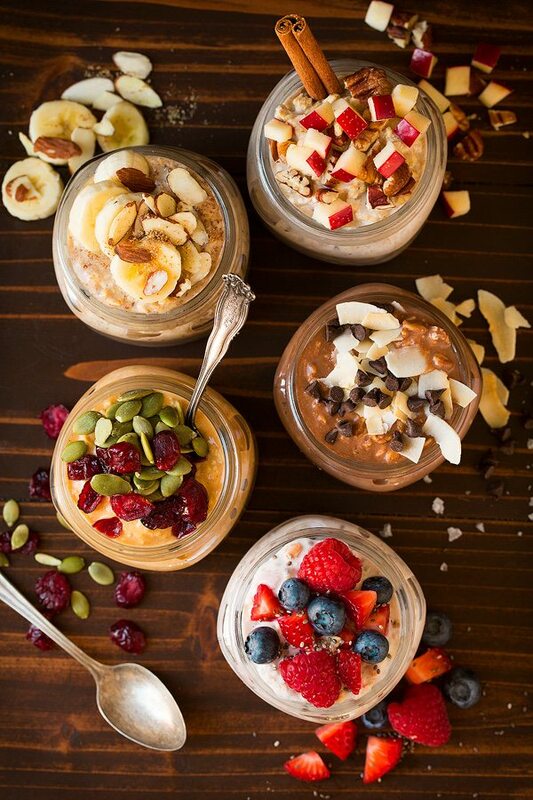 The flavor options for overnight oats are endless. 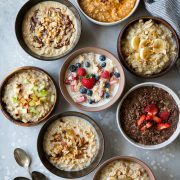 You just prep the oatmeal with your mix-ins the night before you want to eat them, then wake up to a ready-to-eat, delicious, creamy bowl of oatmeal the next day. I couldn’t pick just one favorite, so I’ve picked five healthy overnight oat recipes I use to share with you guys. What Ingredients go into Overnight Oatmeal? Old fashioned oats – for best consistency don’t use quick oats. Unsweetened almond milk – another type of non-dairy milk will work here such as rice milk or coconut milk beverage, or use cow’s milk. Greek yogurt – the thickness of the Greek yogurt makes these nice and creamy. You could substitute a non-dairy yogurt if needed here too. Sea salt – regular table salt will work too. Honey or maple syrup – I like to sweeten with honey or maple syrup for a healthier option but brown sugar or a sugar free substitute will work too. If you don’t like them very sweet you could even omit the sweetener. Mix together oats, almond milk (or other milk of your choice), Greek yogurt, and mix-ins and sweetener of choice. Enjoy them the next morning! First up, there’s the banana almond flax. These are the best overnight oats. If I had to pick a favorite, this may just be it. I just can never get enough of that delicious almond extract flavor and it’s so good with almond butter and bananas. It makes it taste more like a treat. Then that bit of flax in it just adds a little more nutrition. The next one here is the Pumpkin Pie Overnight Oats. It like a healthy version of pumpkin pie, and it’s perfect for this time of year when you have a little bit of left over pumpkin puree in your fridge that you need to use up. Pumpkin pie for breakfast? Yes, please! With this one I’d say 1 Tbsp maple syrup is a must, but maybe that’s just me. With any of these, you can use an alternate form of sweetener such as stevia. 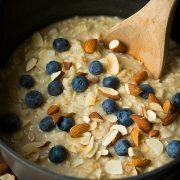 I just prefer the flavor of honey or maple syrup in this overnight oat recipe. Another overnight oatmeal flavor you need to try is this Berry Chia Overnight Oats. This one is perfect for summer when all of those sweet, juicy berries are in season. I love the light and healthy berry and chia seed combo, and it works perfect for overnight oats. Here’s another one I love that mimics an decadent treat. 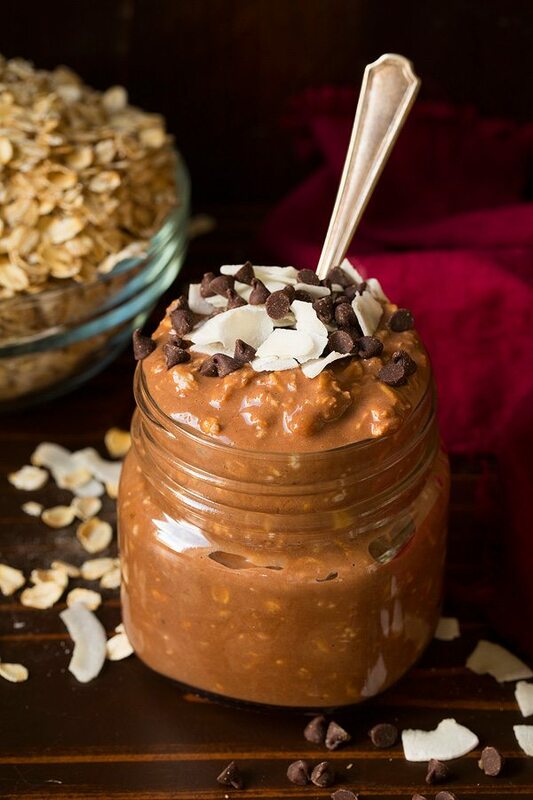 These Chocolate (optional Peanut Butter) Overnight Oats are dreamy! What better way to start your day out than with a little chocolate? It’s kind of like eating chocolate pudding, and you’re going to love it! I personally prefer this version with a scoop of peanut butter, but try it with and without and see which you like better. 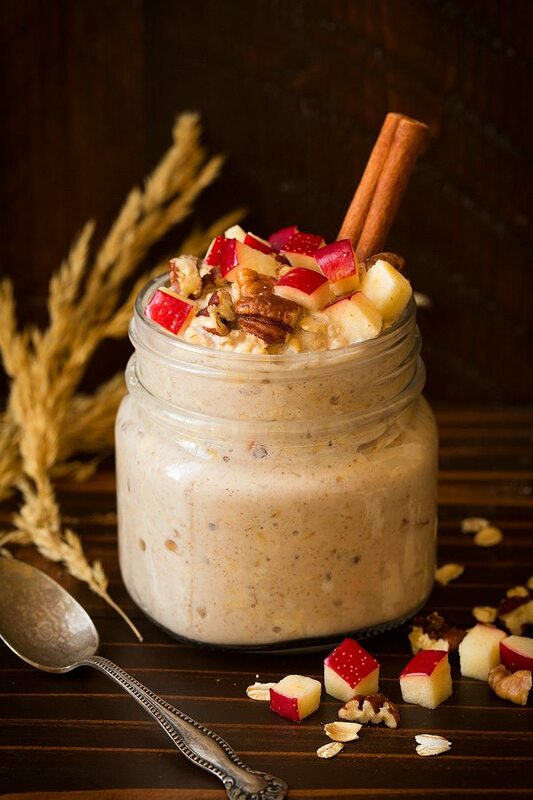 Another one that’s perfect for this time of year with all of the apples galore are these Apple Autumn Spice Overnight Oats. I just can’t get enough of those crisp, sweet little bites of apples. They are a great way to put the apples in your fridge to good use and your mornings will thank you! 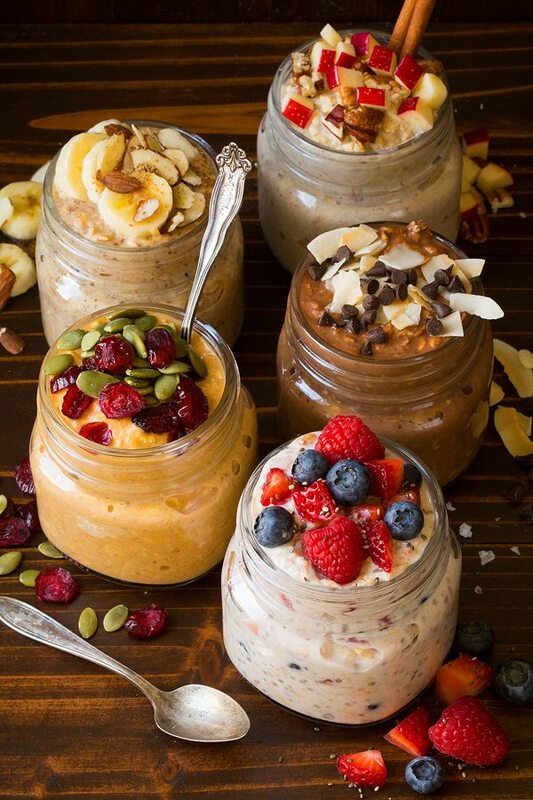 Now get started with the base overnight oats recipe below, try these flavors I’ve shared, and create some of your own! Please let me know which of these flavors you try and enjoy! And also let me know of your other favorite flavors. Be sure to use old fashioned rolled oats here (not quick oats), or you won’t get right consistency. Measure ingredients for the most consistent results. Don’t just dump and guess. Don’t forget the salt or the oats will taste flat. Let the oats soak for at least 4 hours — or 8 hours for even creamier results. Wait until the morning to add crisp ingredients (like nuts) to they’ll stay nice and crisp. Get creative! The mix in options are endless. 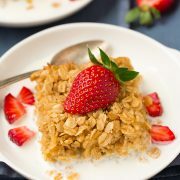 Five delicious variations on overnight oatmeal! These prove breakfast on the go doesn't need to be boring. Prep these simple oats the night before then they're ready to go first thing in the morning. You'll love all of these flavor options! Add oats, almond milk, yogurt, salt and honey or maple syrup to a 16 oz. jar or bowl. Add mix-ins listed for desired flavor (don't add toppings until the next day). Stir then cover and refrigerate overnight. Thin with more almond milk if desired, add toppings if listed. Nutrition facts include oats, almonds milk, yogurt, salt and 2 tsp honey. Other mix-ins are not included. Be sure to use old fashioned rolled oats here (not quick oats), or you won't get right consistency. 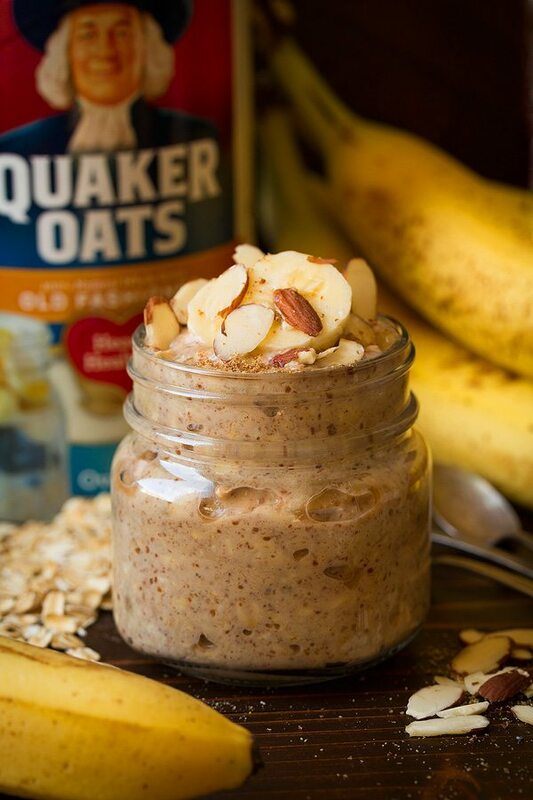 Let your oats soak for at least 4 hours — or 8 hours for even creamier results. To keep things like nuts crisp, wait until the morning to add them so they keep that nice crunch. Sissy: I m confused, do I hear to eat, if so how long, microwave or oven?